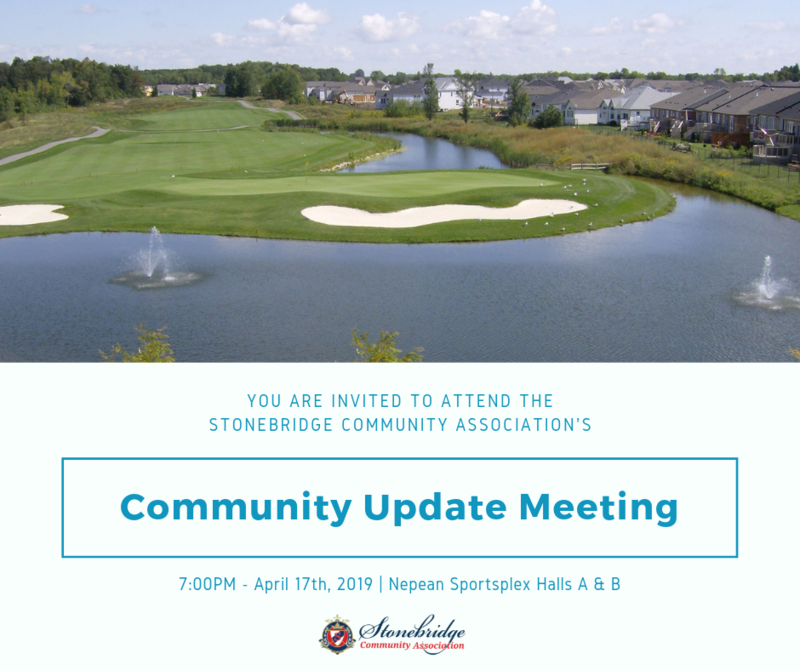 The SCA invites all Stonebridge residents to a community update meeting regarding the golf course development file. The meeting will be held at the Nepean Sportsplex on April 17th at 7 pm (Halls A & B) in order to accommodate the anticipated large crowd. The SCA has decided to call this meeting to allow the City to provide an in-person update on the recent change in direction that has occurred regarding talks with Mattamy and to get as many of your questions answered as possible. We have attached a letter from Stephen Willis, General Manager of Planning, Infrastructure and Economic Development, City of Ottawa explaining the change. Stephen has agreed to speak to his letter at our meeting. Following Stephen’s overview, Jack Stirling, an independent consultant proposed by the City in place of Nicole Swerhun, will elaborate on his proposed process. This will be followed by a live Q&A session with Jack who we expect can answer questions directly. We, the SCA will host, but yield the time to Jack Stirling in order to maximize the sharing of information. We will be available after the meeting, and for as long as needed, to speak with residents directly and to answer any questions about what has been done to date. The SCA expects things to move quickly from this point forward and we strongly encourage residents to attend this meeting. Please watch for follow up communications right here on our website, on Facebook and on Twitter in advance of the meeting. Will the meeting be live streamed again? Yes, that is currently the plan.